Here’s what I wore today! 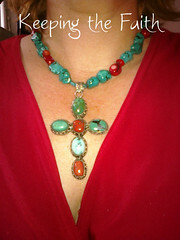 This necklace was refashioned from three other pieces. The centerpiece was originally a small wall hanging; I added the bail. The turquiose stones came from an old necklace,and the coral stones came from an even older bracelet that I didn’t wear any more. Though you can’t see them in this snapshot, there’s is a pair of matching turquoise earrings that I made, as well. I really like this statement piece! And just so you know, while trying to take this picture of myself, I realized that I now have a turkey neck with lots of saggy skin ACK!! When that THAT happen? Do you know how hard it is to take a picture of yourself while looking up at the ceiling in order to stretch out your turkey neck? I took a dozen shots while before I managed to capture just the necklace, and I still cropped out my recently discovered old-lady neck! Previous Post I'm So Going to Do This!